Rules and regulation is required in almost everything for proper functioning of the concerned thing. As disciplinary conventions help humans in following a regulated life similarly POP, IMAP and SMTP that are TCP/IP protocols assist in modern day communication through emails. The three are a definite set of rules that govern sending/receiving mails through Internet between clients and servers. However, they differ from one another in more than one aspect and advantages as well as disadvantages are associated with them. To understand differences between them it is essential to know what they are, what they do and how they function. 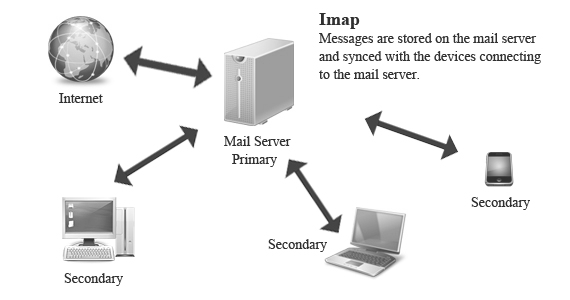 Yet there is a primary thing that distinguishes both POP and IMAP from SMTP. The basic dissimilarity is that POP as well as IMAP is used for receiving messages while SMTP assists in sending mail through network. Note – TLS and SSL are types of Internet security. MAIL – This command is used to establish return address path if emails get bounced. RCPT – This command is to establish the mail recipients. DATA – It is used to send text messages consisting of header and a body. 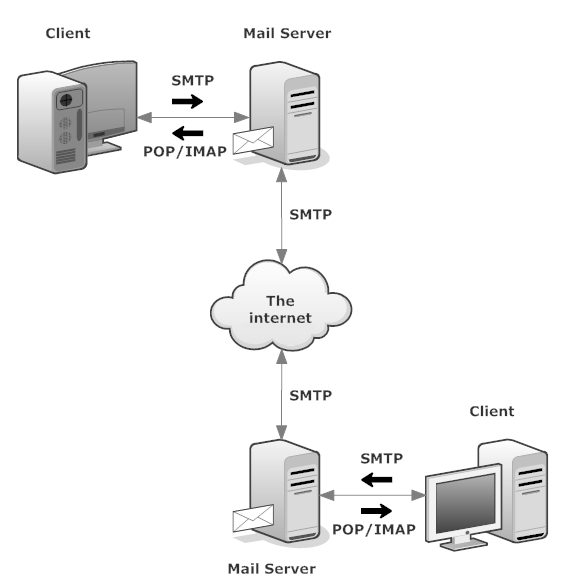 When client wants to send emails, SMTP establishes a two way transmission channel to the SMTP server. The responsibility of client is to deliver messages to one or more servers as the case may be or to report its failure. The servers can either be midway nodes or the final destination. Then the above mentioned 3 commands i.e. MAIL, RCPT AND DATA are issued by the client and sent to server. Thereafter replies are sent from server to the client in response to the commands to achieve transmission. POP/POP3 – It stands for Post Office Protocol and the number 3 represent its version which is the current one and the latest, whereas POP 1 and 2 are its lower releases. Same as SMTP it also belongs to application layer of the protocols in TCP/IP suite. 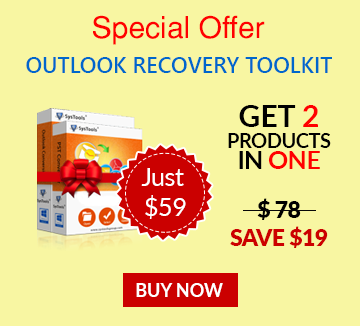 It allows an email client to retrieve emails from server. It is uncomplicated and does not boast of exceptional features except for download (which is its main characteristic) as it is meant to download messages only once from the server and this is one of its disadvantages. Also it does not permit synchronization which adds to its not being preferred. This can be understood in the next section. Note – Although, there is a provision to leave the messages on the server but to do so some changes in the settings have to be done. IMAP – It stands for Internet Message Access Protocol and belongs to application layer in the TCP/IP suite. The current version that is being used today is release 4. It is similar to POP in the sense that it is also used to receive emails from mail server. However, it has many more characteristics as compared to POP3 and is designed to let users continue to access emails from the server. Therefore it needs more drive space on the server and also more CPU resources as compared to POP3. This can be understood in the next section. Here all messages are stored on the server unlike POP where messages get deleted. Hence, clients can access mails from the server anytime anywhere and on any device until there is an issue of server downtime. This is because the emails do not get deleted in IMAP communication and this is one of the reasons behind its popularity. Note – However, if required the emails can be deleted from the server manually which depends on user. The next factor that makes IMAP advantageous is that it has synchronization capability which lacks in POP. Outgoing mails are saved on server also and this feature can be proved by the fact that the default sent items folder or any other folder created gets updated once changes have been made, no matter from which device or system you log in to your account. But in POP the outgoing emails are stored locally on server. Hence, the sent items or any other folder gets updated only on the system on which changes have been done. Note – It is not that problems or bugs do not exist in IMAP. Here, the trouble is that available space for further data storage decreases as IMAP stores all data on remote server.